Njut av en guidad vandring till kanten av Kings Canyon för en spektakulär utsikt över Watarrka National Park. Denna 4-timmars tur tar dig in i det fantastiska landskapet i Australiens röda centrum, med sandstensklippor, grottor och klyftor som gömmer frodiga vattenhål. Vandringen är idealisk för personer med en bra fitnessnivå som kan vandra flera miles, inklusive en ojämn uppförsbacke. Du kommer att belönas med en djup erfarenhet av denna landmärke destination. Om önskad erbjuder Creek Bed Walk ett lättare alternativ. A trip to central Australia is a journey of delights. 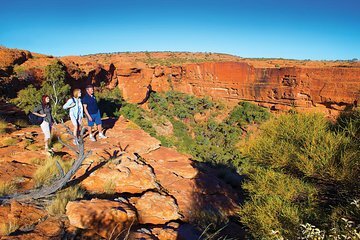 Kings Canyon Guided Rim Walk brought forward the true majesty of the land, highlighting the deep oranges of the rocks the mighty natural formations along with a chance to achieve varying levels of challenges, depending on your ambition. The steep climb at the beginning is the toughest part and all over in 8 - 10 minutes. The rest of the walk is so breath taking showing off ancient rock formations, deep dark pools and prehistoric cycads. Our guide explained so much to our small group because he cared so much about the region with its history, geology and the First Nation people who have so much history behind this amazing walk.